How to Put Blu-ray & DVD to iPhone 6/6 Plus? Now phone users can enjoy a “bigger than bigger” iPhone - iPhone 6 and iPhone 6 Plus. Compared with the fomer generations like iPhone 5S and iPhone 5C, the screen resolutions for the new iPhone jump to 1334 × 750 and 1920 × 1080 respectively. And viewing experience with Retina HD technology is definitely awesome! What you can do with iPhone 6 and iPhone 6 Plus is watching Blu-ray and DVD collections on them. The question is how to transfer Blu-ray and DVD movies to iPhone 6 or iPhone 6 Plus. What you’ll need is a program able to convert Blu-rays and DVDs to MP4, M4V, or MOV videos which can be synced with iTunes and are playable on iPhone 6/6 Plus. What kind of video converter or can both take and convert Blu-ray and DVD sources to iPhone 6 supported video formats? Pavtube BDMagic can! This iPhone 6 converter can ingest and convert Blu-rays, DVDs, videos, and audios to a library of video formats not only for iPhone 6/6 Plus, but for a wide range of devices (e.g. Apple, Android, Windows series, editing programs, video players, streaming media servers, HDTVs). How to make Blu-ray and DVD playable on iPhone 6/6 Plus? Download and run this iPhone 6 video converter on PC (get iPhone 6 converter for Mac). 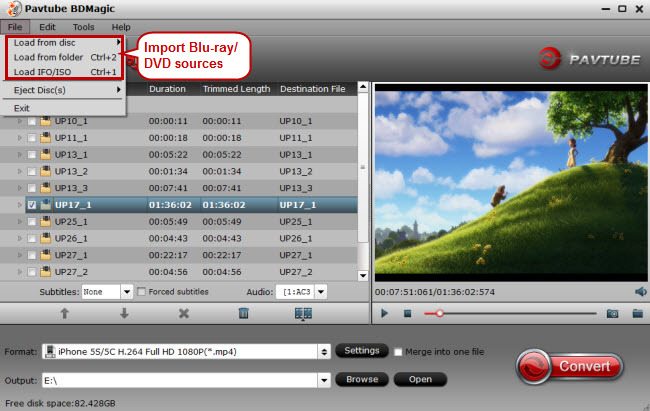 Click “File” “Load from disc” to import Blu-ray or DVD movie. An internal or external Blu-ray drive is required to recognize the Blu-ray disc. If you got other Blu-ray and DVD sources like Blu-ray Image, Blu-ray folders, DVD folders, DVD IFO files, and DVD Image, just choose “Load from folder” or “Load IFO/ISO” option according to the type. When syncing video files to iPhone 6 or 6 Plus with iTunes, you’d better check iTunes and iPhone 6 supported file formats. 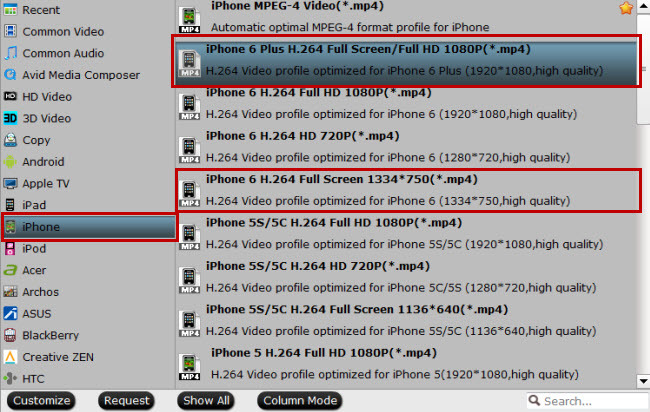 As both iTunes and iPhone 6 support MP4, MOV, and M4V, you can just select one of them as the output format. Click the format bar to follow "iPhone" ＞ "iPhone 6 Plus H.264 Full Screen/Full HD 1080p (*.mp4)" for iPhone 6 Plus, and "iPhone" ＞ "iPhone 6 H.264 Full Screen 1334*750 (*.mp4)" for iPhone 6. 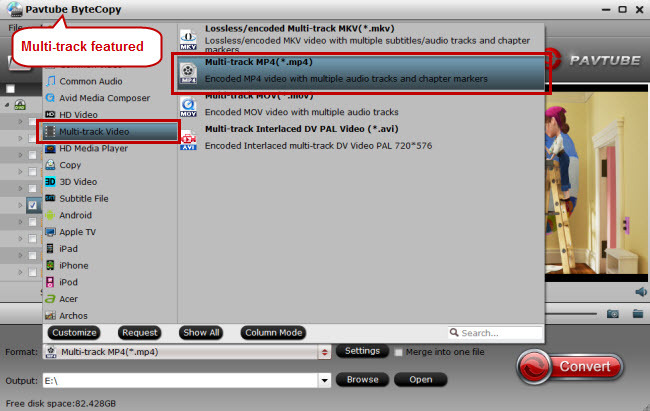 To get MP4 output video with multiple audio tracks and chapter markers preserved, Pavtube ByteCopy, another iPhone 6 video converter, is proper to convert Blu-ray and DVD movies to multi-track MP4. 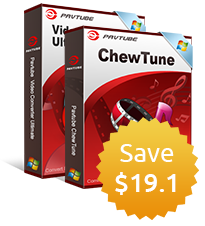 Mac users can download the Mac iPhone 6 converter - Pavtube ByteCopy for Mac. Hit on the big red button “Convert” at bottom right screen to realize Blu-ray and DVD conversion to iPhone 6 and iPhone 6 Plus. To move the converted Blu-ray and DVD movie to iPhone 6 or iPhone 6 Plus, you need the help from iTunes. First of all, transfer the converted Blu-ray and DVD movie to iTunes library, and then connect your iPhone 6/6 Plus to PC or Mac, and start syncing. Video Tutorial - How to Put Blu-ray & DVD to iPhone 6/6 Plus? What are the best apps for iPhone 6 or iPhone 6 Plus? How to get the best solutions and tips for pleasant enjoyment on iPhone 6 (Plus) at one place without spending too much time searching online? Pavtube has released iPhone 6 topic which covers everything you need when having fun with your iPhone 6 or iPhone 6 Plus?